I stumbled across NatureBox when a few of the beauty guru’s/vlog I follow on YouTube starting talking about it. I was curious and rolled on over to the website to have a look. 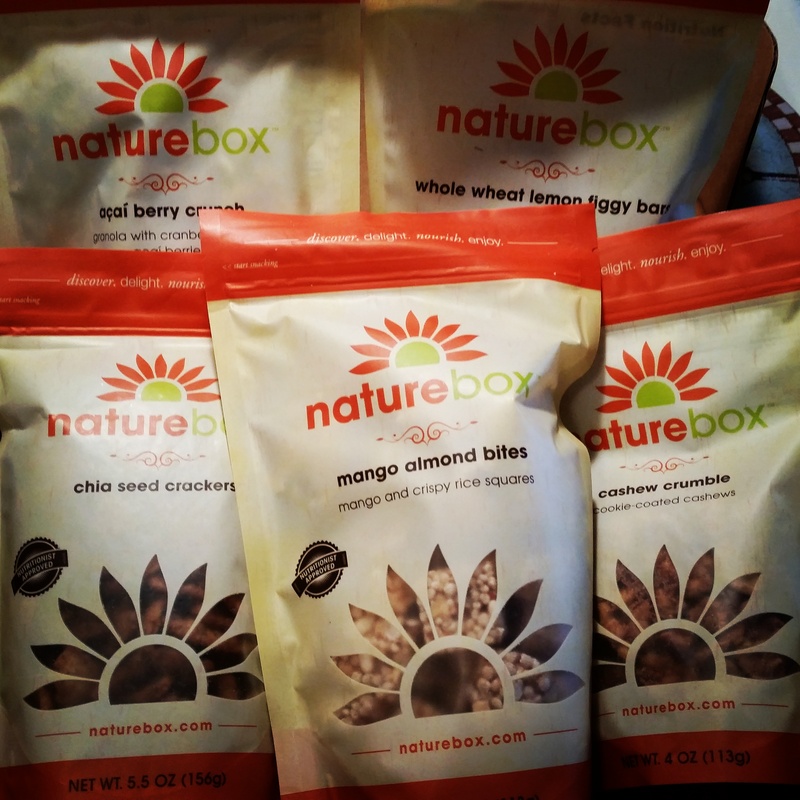 NatureBox is a monthly subscription box of 5 full size snacks. You can choose your own from the different 100+ snacks or you can receive a “surprise” box each month. Choices range from Gluten-free, Vegan friendly, Dairy-free, nut-free and many more. From what I have read they use Non-GMO wholesome ingredients with the snacks being minimally processed, meaning there is not a whole lot of garbage added to them. In addition, most snacks have a nutritionists’ seal of approval. Here is one down side, Canada is currently in a “beta phase” of testing so your only option is the “surprise” box, but you can see what is in the box well ahead of time and you can choose to hold off on your subscription that month if you are not excited about the contents of that month’s box. I have received 2 boxes from NatureBox and so far there hasn’t been one snack that I am not happy with. There has been a good balance of sweet and savory snacks in my box ranging from super crunchy to soft and chewy. Every package has been packed full of taste and flavor. They come in resealable bags that keep the freshness locked in. My favorite so far has been the Coconut Date Bites. I put them directly into the freezer and whenever I was craving something sweet I would grab a couple. Why did I choose to give NatureBox a try? As someone that is tackling her health and well-being and has a bad habit of being a bit lazy I wanted to have items in the house that were more nutritious for me than the cookies, ice creams treats that would normally fill my house and cupboards. I will say the sugar content in some of the snacks is a bit on the higher side, but it is naturally occurring sugar, not added refined sugar. Eating a handful of dried apple slices is a better choice than a Snickers bar or a package of M&M’s. For the $19.95USD a month, I find NatureBox to be a great value for the types, quality and size of snacks you receive. When Canada launches there fill site I look forward to being able to choose snacks that are a better fit for my goals moving forward.